Our 4 Color 4Station Screen Press can apply 4 screens to 4 stations simultaneously. The thescreen layer and the pallet layer can rotate independently, which makes iteasier for multi-color printing, material loading and unloading and finally willbring much wider range of applications and faster printing effects. Our 4 Color 4 Station Screen Press can apply 4 screens to 4 stations simultaneously. The the screen layer and the pallet layer can rotate independently, which makes it easier for multi-color printing, material loading and unloading and finally will bring much wider range of applications and faster printing effects. 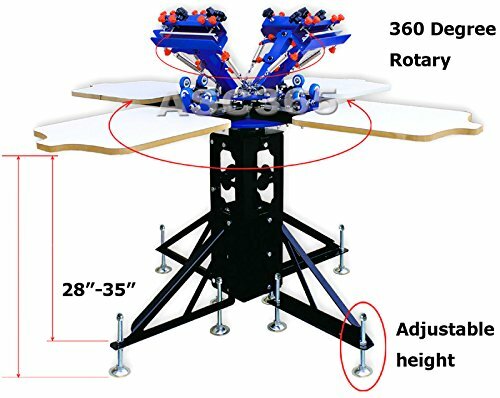 Comparing with the original 4 color 4 station printer, this new type machine has a function of micro-adjust/registration.New design metal stand could adjust the height from 28"-35". If you want to do precise color matching, you can use those small red handles to movethe screen frame right or left slightly. It will be a good choice forcolorful printing.